Since 2015 the Freiburg STI Centre for Real Estate Studies (CRES) has been commissioned by Porta Mallorquina Real Estate S.L.U. to analyse the market for holiday homes on Mallorca. The data base for the 2017 evaluation consisted of 4,711 Mallorca properties from the online offers of the island’s five largest brokers, examined in terms of price, location and equipment. The market study takes into account approximately 90% of the portfolio of Mallorca holiday properties available online and is thus representative. The Centre for Real Estate Studies, commissioned by Porta Mallorquina Real Estate, compiled a representative study of the holiday property market in Mallorca. What does a sea view cost? The real estate offers in Mallorca are concentrated mainly in the western region and the capital, almost two-thirds of the offered properties are located in the south-west, the north-west and in and around the capital Palma. In 2017, the increased demand for Mallorca real estate is making itself felt for the first time throughout the island. The analysts recorded the largest price jump in the north-east region at 15%, with the average square metre price rising from € 3,530 in the previous year to € 4,070 in 2017. 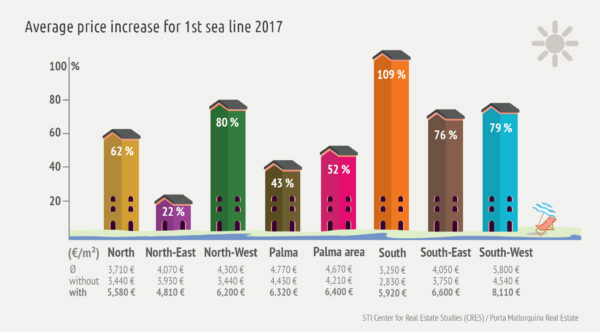 The south-west region will continue to be the most expensive region in Mallorca in the current year and the average square metre price has risen from € 5,150 to € 5,800, an increase of 13% compared to the previous year. As the most favourably priced region in 2017 the centre of the island, with an average price per square metre of € 3,070, took over from the south region which in the previous years had offered the best entry prices. The main price booster, according to the market researchers, is the sea vie which is confirmed by the fact that the centre of the island, which offers at most distant views of the Mediterranean, has been identified as the average most favourably-priced region. The STI Center for Real Estate Studies found an average surcharge for the coveted view of the Mediterranean Sea of around 30%. Not only property buyers are ready to pay a hefty premium for the desired views, but also the holiday guests prefer to book properties with sea views. This means that the higher initial investment has a quicker amortisation in the form of higher returns for the investor. Due to the strict Spanish coastal protection legislation and restrictive building regulations in the Balearic Islands, real estate on the first sea line is limited and correspondingly desirable. This premium location can almost double the value of a property, depending on the region. In the south, for example, the first sea line with panoramic views command an average surchargeof 109%. The most favourably priced 1st sea line locations are currently to be found in the north-east, where the average surcharge is only 22%. The market researchers, however, also concluded that although there is a relatively high surcharge for a ”simple” sea view location, the increase from this to a 1st sea line location is relatively low. 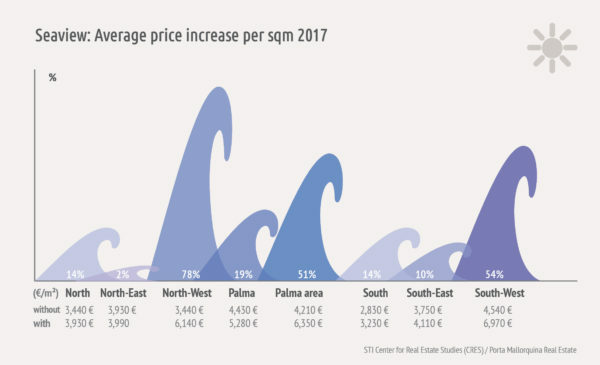 Most expensive is the direct coastal or beach location in the already highly-priced south-west region with an average of 8.110 € per square metre. Due to the qualitatively high level of equipment offered by properties in Mallorca, Prof. Dr. Marco Wölfle, head of department, and his team examined the “luxury real estate” segment in 2017. The categorization was carried out according to an assessment catalogue and relates to factors such as, for example, number of bathrooms in relation to bedrooms, pool size, house technology, furnishings, location etc. Purchasers of luxury properties in Mallorca must expect to pay around 8,000 €/m² and in the south-west even more than 9,000 €/m². 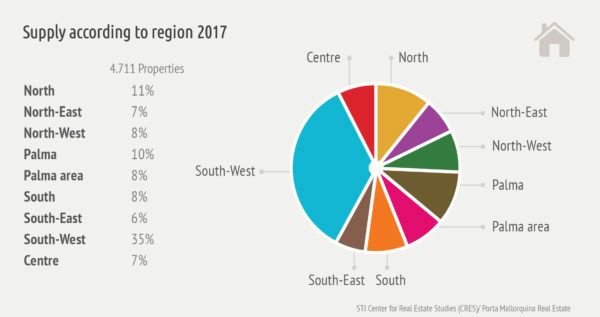 Particularly noticeable here are the regions north and north-west where although generally the price average is more likely to be in the lower segment, prices in the luxury sector are now rising rapidly. Despite the price increases, the STI Center for Real Estates continues to give the green light to investors in Mallorca. The reasons for this are, amongst other factors, the good accessibility throughout Europe, and a wide range of tourist services, but the political situation is now also reflected in the valuation of holiday property markets. Mallorca has become almost an island of good fortune, spared from the flood of refugees by its geographical location and currently experiencing no political or religious unrest. This effect could be observed as early as 2016 when Mallorca, with some 11 million tourists, was able to record a new visitor record which benefited not only the hotels, but also holiday rental property owners. Meanwhile holiday leasing companies expect, for a property in a good location with high-quality equipment and an attractive price/performance ratio, an occupancy rate of around 200 days per year and an average income of € 46,000. These positive investment return prospects are increasingly attracting capital investors to the island, which is increasing demand even more.